Our target plot. This figure is easy to read and the lines are easy to distinguish. Now we’re going to keep polishing the figure by modifying our script. Using the LaTeX interpreter for the axis scales and labels. Using the LaTeX interpreter does more than make the text look like it belongs in your paper. You can also use regular LaTeX math text surrounded by double-$, e.g., $alpha_0$. So if you have variables in your paper then you can have them appear nicely in your figures without needing to edit them outside of MATLAB. Using the default legend text and format. This legend still doesn’t read well. There’s a lot of repetition, and if you took a quick look it would be hard to read. 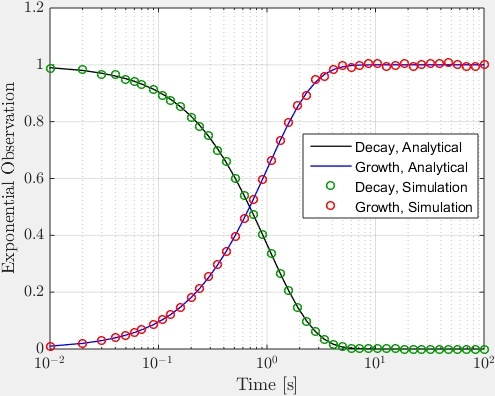 The figure is really plotting 2 phenomena (Growth and Decay). 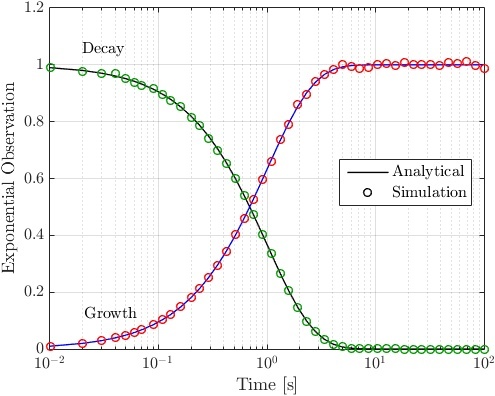 Each one has an “Analytical” curve and a “Simulation” curve. It would be best to only have 2 entries in the legend. Here are two ways to do this. Now, disable and re-enable the legend. The entries that you wanted to hide will be gone. This method works well when you’re manually editing a figure. But, we need to keep the colors of the curves that we didn’t remove. It would be better in this case if the legend entries had “generic” colors (i.e., black). 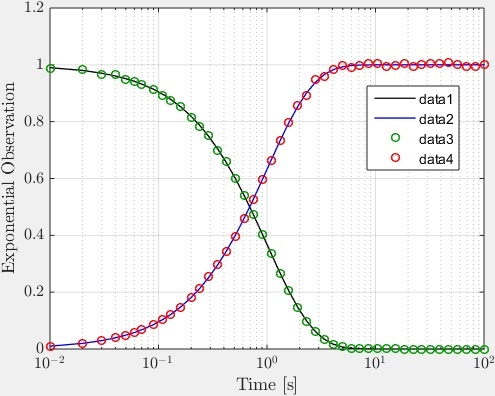 A good automated method is to create “Ghost curves” in our figure that have no data but have the properties that we want to display in the legend. We add these curves first in our script, and only define those entries when we call the “legend” function. To create a curve with no data, use NaN (Not a Number) for at least one dimension (more generally, NaN can be used to leave out individual points when plotting a line). 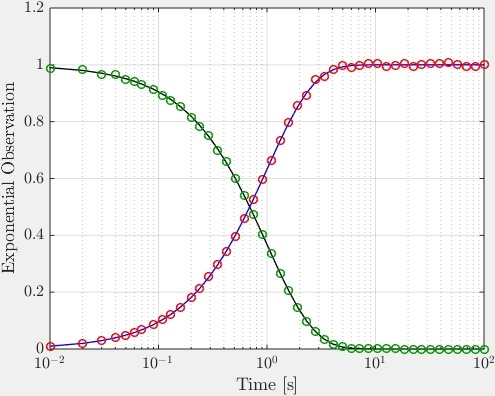 Figure with legend based on ghost curves. 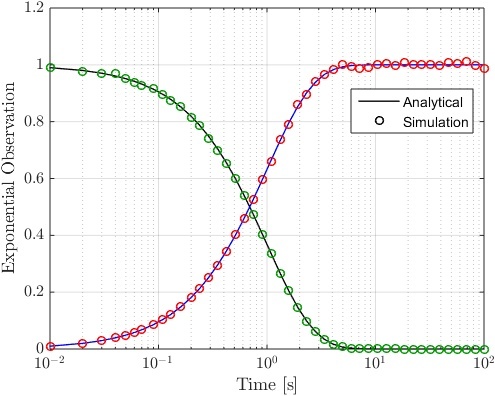 This legend clearly states that any solid line is an analytical curve and the markers show simulations, even if the colors don’t match any specific curves. Set “Background Color” to white (default is transparent). This makes the text easier to read. Set “Line Style” to “none” to remove the bounding box. Set “Interpreter” to “latex” (of course). I will also do this for the legend. If your figure has many sets of curves, then you might find it helpful to be more specific with your annotations. For example, you can group a set of curves with an ellipse and use an arrow to point from the label. I recommend using separate text boxes and arrows instead of a “text arrow”. Text arrows are much harder to tweak because the text location is determined automatically. Figure with arrows and ellipses. 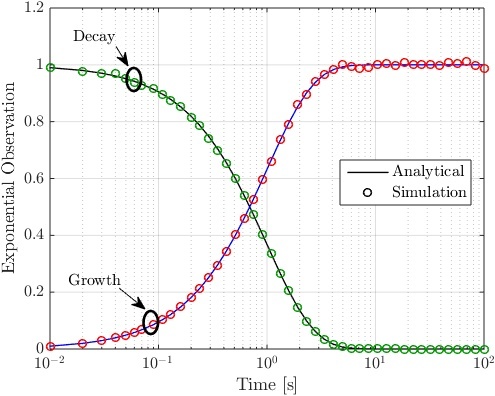 In this case, the arrows and ellipses don’t add much for understanding the figure. But I’ve used them in crowded figures and they can really help to see things clearly. We’ve gotten the original desired figure, so that stage is complete. The next post in this series will look at automating these steps with a wrapper function that you can use when making (practically) any figure.